Shades of yesteryear! 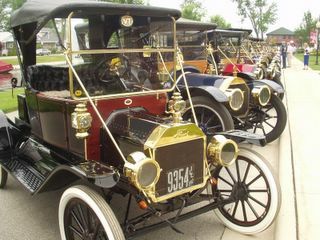 The 1900-1912 vintage cars on display at the “gas and brass” festival in Winona Lake, IN, today were common transportation in the town known as “a kind of religious chautaqua” under the leadership of Solomon C. Dickey. William “Billy” Sunday arrived in 1895 with his wife, Nell, and the baseball evangelist eventually preached to more than 100 million people in his career. The lake had just been re-named from “Eagle Lake” to “Winona Lake” and the town of Winona Lake incorporated in 1913. A year later, in 1914, the “great fire” on Chestnut Street wiped out a significant segment of the town’s properties above what is now the Hillside Amphitheatre and Tabernacle Field. More on the Village at Winona is available at www.villageatwinona.com. Here is a description of today’s festival: Experience the heritage of pre-1912 automobiles when the Michigan Brass and Gas Club visits the Village at Winona® on June 11th. Cruise in to see a 1906 REO, built by Ransom Olds, the founder of Oldsmobile, or other early classics such as Pierce-Arrow, EMF, Jackson, Maxwell, Oakland, White and Winton. Of course, there will also be models made by more familiar names such as Ford, Buick and Cadillac, but all of these early cars will be open cab, canvas-top machines sporting two-, four- or six-cylinder engines capable of reaching the dizzying speed of 30-35 miles per hour.